259/365 – “Metamorfoodist” nr.17, a photo by Luca Rossini on Flickr. 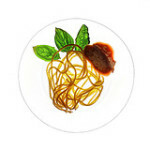 Pan-Fried Gragnano Spaghetti with Mouse of Tomato Sauce and Fresh Basil (“Spaghetti Gragnano fritti alla Mousse di Salsa di Pomodoro e Basilico Fresco”). The double cooking of the spaghetti makes it possible, thanks to the dehydration of the pan-frying, to note some of the tastes which are usually lost with the traditional cooking. 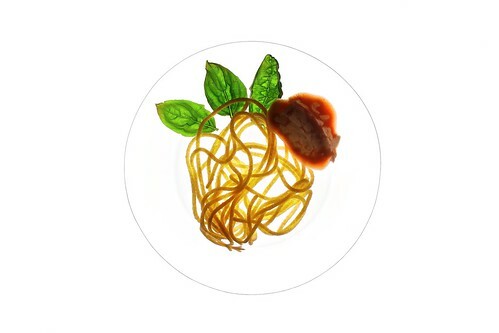 In particular the toasted fragrance goes perfectly together with the round taste of the tomato sauce mousse, till we realise that the apparently simple recipe of “tomato sauce spaghetti”, which we may think to know like the back of our hands, is here to unpredictably surprise us.